The models LS-2137, LS-2147 and LS-2137U combine the compactness of LS-2134, LS-2134U lasers with the increased energy and small divergence derived from an intracavity telescope and special double rod laser pumping chamber which allows operation in oscillator-amplifier mode (Master Oscillator-Power Amplifier MOPA) with a single power supply and a cooling system. Using the unique laser chamber design reduces undesired parasitic oscillations that can limit output energy. The closed and rigid folded structure of the laser emitter provides small dimensions, stable and dust free operation of laser components. 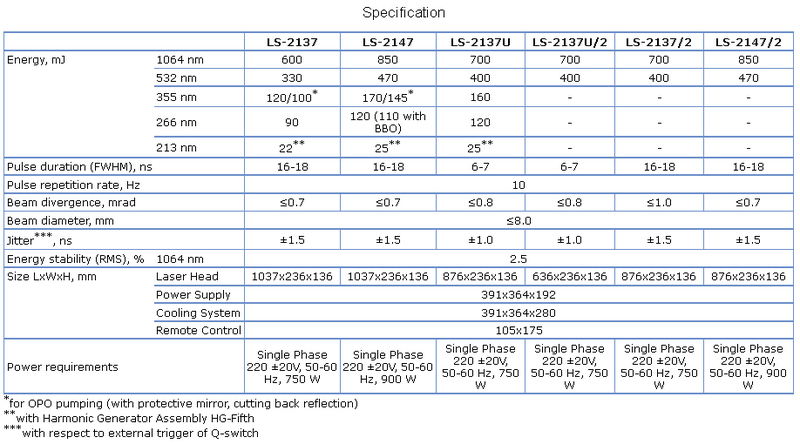 Featuring a VRM, LS-2137U retains the advantages of rugged design, high stability and user friendly operation. The VRM resonator gives excellent harmonics conversion due to increased spatial uniformity of output beam, low divergence and short pulse duration (6-7 nanosecond). The crystals for the second (KTP), third (KDP, BBO or LBO) and fourth (KDP or BBO) harmonics are set in the precise temperature controlled ovens. Harmonic separators provide highly efficient generation and high spectral purity of the output radiation. There is no need for an external water supply: the cooling system is totally self-contained with water-to-air heat exchanger. The fifth harmonic assembly (213 nm) can be added either by using a BBO crystal to mix the fourth harmonic with the fundamental frequency or by mixing the second and the third harmonics. This gives a convenient and cost effective source of a short UV radiation. The lasers LS-2137, LS-2147 and LS-2137U are the ideal tool for research — ablation, OPO pumping, LIDAR, spectroscopy (including LIF, LIBS) — and OEM applications.